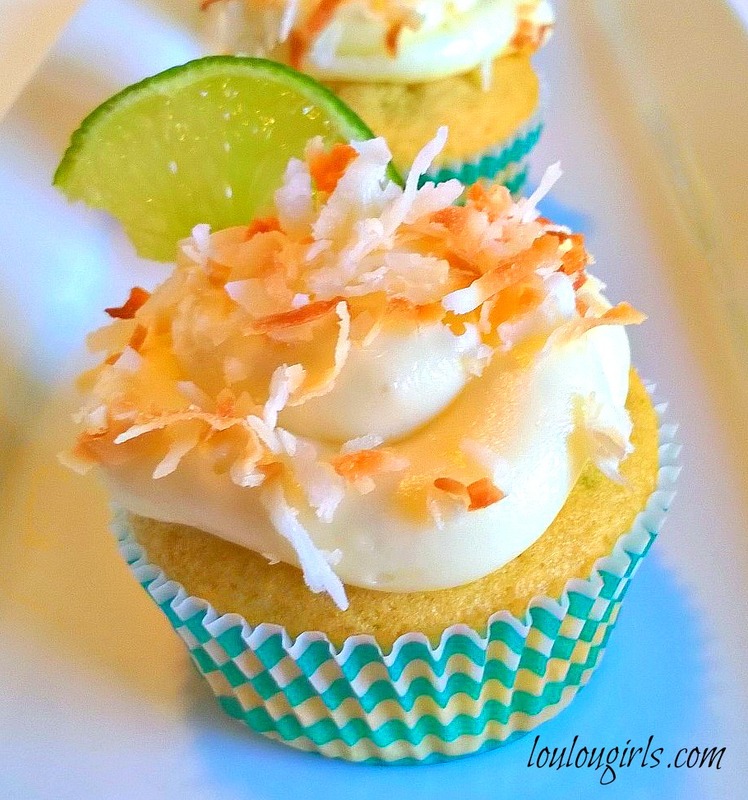 Well, you are probably thinking “why is the Lou Lou Girls putting coconut lime cupcakes on their blog in November?” Welcome to my crazy, wonderful life! Last Friday was the Sadie’s dance for my Andie and the theme was Hawaiian Luau. Andie volunteered me to make cupcakes for her date group. Funny story, I asked Andie when she needed the cupcakes all week and like most teenagers, she told me that she didn’t know and she would let me know. The day of the dance, she called me from school, (while she was in her sister’s anatomy class) to tell me that she needed them after school! First, her sister almost killed her for using her phone in class and promptly took the phone away and then I had to tell her that she wouldn’t be able to have them until her date group were at the home of the dinner was being hosted. She was fine with it all and realized that she had a blonde moment and apologized to her sister. I’m hoping that all you cute people need a break from all those delicious pumpkin and apple recipes floating around the internet and your life is as random as mine! They are seriously so good and would be a great addition to any holiday gathering this season! Preheat the oven to 375 degrees and line the cupcake pan with liners, set aside. In a different bowl, combine the eggs, and sugar. Then add the butter, lime zest, and juice, coconut extract, and coconut milk. Slowly incorporate the dry ingredients into the wet ingredients until well combined. Do not over mix. Fill each cup to 2/3 full. Bake for 15 minutes to 17 minutes or until the cupcake springs back when you lightly touch them. Cool completely. Frosting: In a bowl, combine the cream cheese and butter. Then add the coconut extract and powdered sugar and mix until well combined. If you want the frosting stiffer, add 1/4 cup more powdered sugar until you get your desired consistency. I use a pastry bag to put the frosting on my cupcakes but you can also use a butter knife if you don’t have a pastry bag. 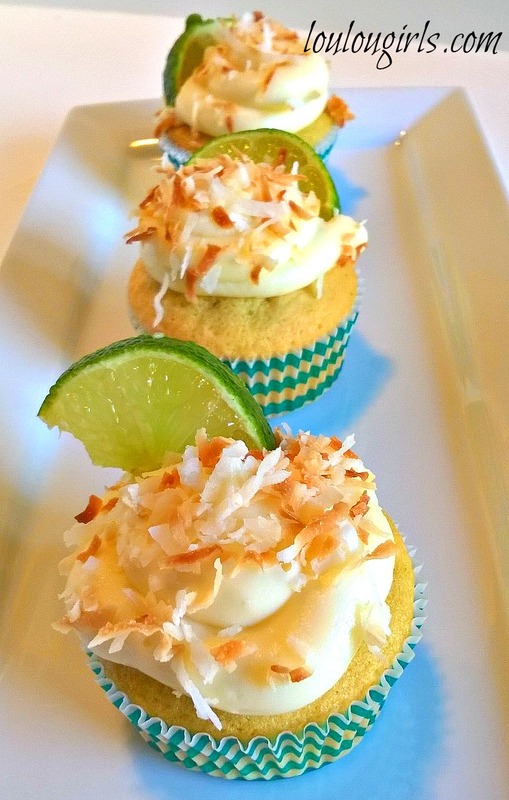 Sprinkle the cupcakes with the toasted coconut and garnish with the wedge of lime. 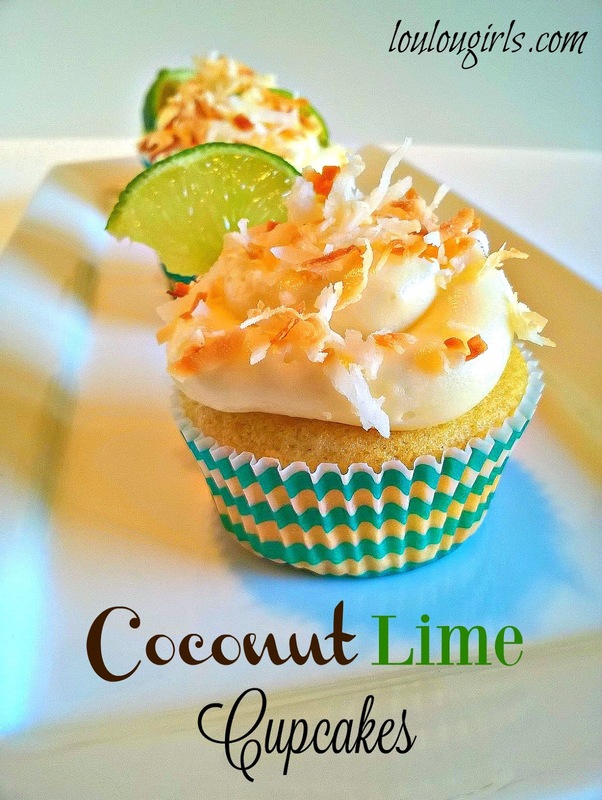 You always have my attention when you mentions coconut and lime in the same sentence! These looks totally yum, and the photos are gorgeous! We've hit a cold snap and had our first snowstorm of the season – which I'm completely not ready for, so I'm not sure if this (adorable and yummy looking) reminder of summer is welcome or not! 😉 Your daughter is a very lucky girl. These are such great flavors! Thanks for linking up with What's Cookin' Wednesday! We would love your Cupcakes! Your recipe is awesome, I have pinned it. We really enjoy you sharing with Full Plate Thursday and hope to see you again soon! I'm always happy to enjoy coconut and lime, whatever the time of year! Thank you for sharing these delicious cupcakes with us at the Hearth and Soul Hop. Sharing! Yum, yum, yum! These sound perfect for Cinco de Mayo too! Thanks for linking up with Merry Monday!